I’m not sure how long ago I learned how to knit – maybe 3 years? I feel like I’ve been doing it forever. 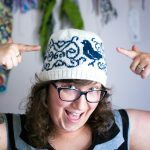 I feel insanely guilty when I’m not producing something and I could be – knitting can be done (unless it’s a complicated pattern) while watching TV, sitting in the car, at my lunch break… And it’s a nice way to zone out while still creating something. Elizabeth Zimmerman is a big name in knitting. She created tons of patterns but also re-introduced continental style knitting to the US after WWII. For non-knitters, continental style knitting refers to the way the yarn is wrapped around the needle to make a stitch. It’s, in my opinion, way faster than knitting English style, which requires you to drop your left needle to wrap the yarn around the right. But, aside from that, she also had a knitting series on PBS, knit on the back of her husband’s motorcycle (how badass?) and wrote a few books.